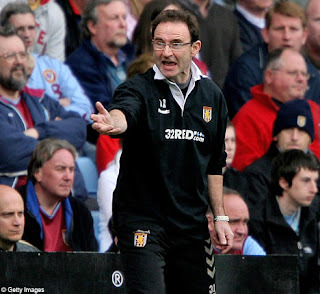 O'Neill quit rumours make Aston Villa fans groan! 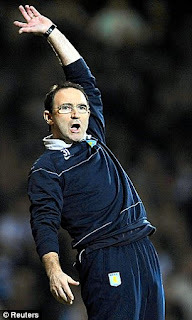 If you've followed Villa for over thirty years like me, rumours that Martin O'Neill tendered his resignation after meeting owner Randy Lerner has more than a whiff of our long and extinguished history. Just as we look like producing a winning team, competing for the big prizes, the owner b****cks it up by failing to back the manager, who then walks out - or gets the sack. Villa fans have experienced this before: just the names have changed. For Randy Lerner, read Deadly Doug: for O'Neill, read Ron Saunders, Ron Atkinson and Brian Little. 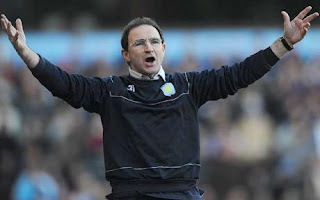 O'Neill's talks with Randy are said to have revolved around the transfer budget for next season. 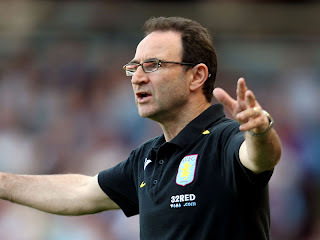 Although there are legitimate concerns about the relationsh ip between owner and manager – Lerner's thought to want to cut the squad and wage bill this summer, countering O'Neill’s demands of a continued cash injection – Villa swiftly denied the Ulsterman had left the club. The confusion came just days after Villa’s devastating 7-1 defeat at Chelsea, which has left our chances of a top four finish look slim. It was a result which O’Neill took full responsibility for. He said: "The buck stops with me. It is my responsibility, it is as simple as that. Thankfully we don't have any midweek games now for a little while - but that would sound like the number of games we've played is an excuse. Please don't even go there - that was nothing to do with whether we had a midweek game or not. "We've shown a lot more desire and a lot more character than we did against Chelsea and that is totally my responsibility. Whatever you say about performances and it is all very well talking about the players, that is down to me and that is my responsibility." Villa must play Chelsea again in their FA Cup semi-final on April 10. You might be a Villa fan, you might be a fan of the team we're playing. You might've "only come to see the Villa!". What's undeniable is the sheer passion and entertainment value of the Villa boss watching the game unfold on the touchline. Rarely has there been a manager watch with such intensity. Rather than kicking every ball like some rabid Dave Bassett or Barry Fry, O'Neill's accessing his sizeable intellect. A ticking timebomb, he scans the pitch judging the victor of individual player battles, assessing the tactical spread of players and where the threat is coming from in the opposition line-up - real or existential! So when we score, he jumps with the eruption of a volcano. The larvae in his explosive body can't hold anymore. He's a man who understands what's needed and if Villa are serious about becoming a force in Europe again, Randy needs to back the former Celtic chief. He's the best man for the job, no question. Otherwise the Big Project is over - and Villa will be consigned to mid-table obscurity or worse! For your Soccermongery delectation, here's a collage of O'Neill in action! Pictures expressing his many emotions. Manchester United 2 Liverpool 1 ... er! Wishful thinking from Betfair's Liverpool-supporting design department? Shome mishtake surely! 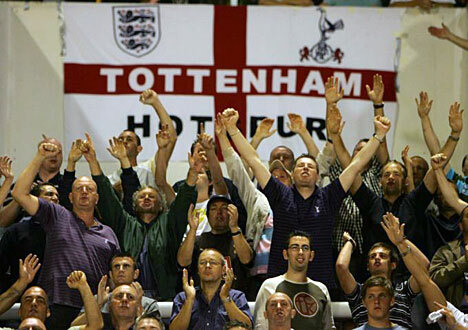 Also on Soccermongery: Why do the Spurs faithful want 'Arry out? 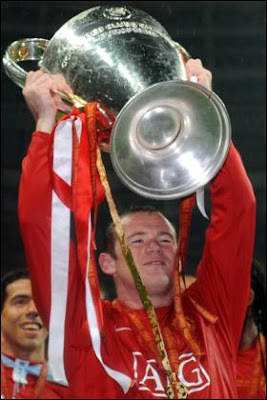 and Will United REALLY sell Rooney? Why don't the Spurs faithful like Harry Redknapp? He's steered Tottenham to the upper echelons of the Premier League in double quick time. His crafty transfer dealings and commonsense squad building have put Spurs in the Box Seat to qualify for next season's Champions League. Hasn't Redknapp done enough to win over the White Hart Lane faithful? Many rightly say Martin Jol shouldn't have been sacked despite two successive fifth placed finishes. But for Lasagnegate, the Dutchman might've coached Spurs in the Champions League. Then again, the club came undone so fast under the disastrous stewardship of Juande Ramos that they might've been playing Championship football with fallen giants, Newcastle and West Bromwich Albion. Redknapp stopped another Newcastle from happening at Tottenham. There are real parallels between the two clubs. The late Sir Bobby Robson steered Newcastle to two successive fifth-placed finishes before being sacked. A succession of managers failed to live upto Sir Bobby and it all ended in tears with relegation last season. As a Villa fan, I can't believe the lack of respect for Redknapp. In our case, Martin O'Neill's done a similar repair job at Villa Park. Deadly Doug and David O'Leary were getting it all wrong. Then O'Neill arrived, with the funding and goodwill of new owner, Randy Lerner. Now we've a real chance of silverware and we dare to dream of a second European Cup to add to our collection! We wouldn't want a highly paid mercenary like Mourinho supersede the MON Project. No way! Under Redknapp, Spurs can grasp one of football's most highly-prized possessions - something Arsenal have in abundance and which has led to much glory. Stability. For me, Redknapp's a Tottenham success story. Click here: Will United REALLY sell Rooney? and Why do TV pundits endorse cheating? Why should football be about cheating and gamesmanship? Two telly pundits endorsed cheating in two separate shows on Sunday. 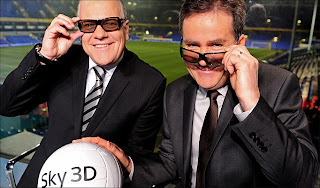 In both cases, the reaction of Adrian Chiles and Richard Keys was a rather feeble "fair enough", even though it seemed to offend their sit-on-the-fence sensitivities. They happened during Andy Gray's Final Word, then MOTD2. Gray, whose view of the Premier League is now quasireligious, suggested Wayne Rooney's calmish discussion with the ref while walking off at halftime against Fulham, would encourage the man in black to think twice before ruling against him after the break. Another instalment in Manchester United's chipping away at the referee. Sledging, now endorsed by Gray. Then Neil Warnock explained that Adam Johnson's brilliant equaliser in injury time for Manchester City at Sunderland should've been denied by deliberate handball. "The defender would've taken one for the team with a red card and missed a game", but according to Warnock, preferable for Sunderland to test the nerve of a City player taking a last minute penalty then accept a brilliant piece of skill. Johnson's winner has put him in Fabio Capello's thoughts on the day David Beckham's England career finished. His exceptional piece of skill would've been buried in that last-minute penalty rather than being enjoyed for a long, long time. Rooney needed less than two minutes to score the opener for United as the second half resumed. He's got more than enough in his locker not to rely on hounding officials. If you think I'm being namby pamby - and it should be accepted as "just gamesmanship" it is for me, the slippery slope. Football can't just be about abusing a position of strength over the weak - football matches must be won on merit and brilliance. Football no longer teaches youngsters about integrity. People like Andy Gray have as much of a responsibility for the game's image as the players out there. The term "legend" is used so glibly these days. But not so when applied to Jimmy Bullard! The Hull City midfielder, who put Phil Brown firmly back in his box with this goal celebration at Manchester City, has done it again. Watch and enjoy this advert for Wash n' Go. Take two bottles into the shower? Not our Jimmy! Sign him up! Sign him up! Sign him up! He's the chief talisman, the embodiment of modern Liverpool who more than anyone shoulders the burden of their failings. But Steven Gerrard's loss of form and injury problems is an outward sign his career's hit the buffers. The one-man show, so often the Reds' Saviour needs to leave Anfield to kickstart his career. His club performances have lacked discipline this season and fit players don't get injured. 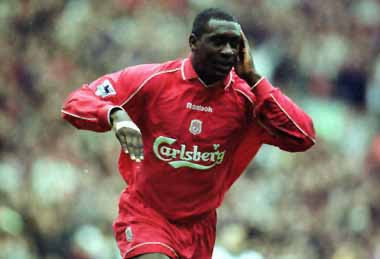 His wild celebration when scoring from the spot at Spurs smashing the ball against the crossbar as it rebounded out the net, to scything down Reo-Coker to concede a penalty against Villa stand testimony to a man in turmoil. Both of those games ended in defeat too. The two reasons he's stayed at Liverpool this long look more and more flimsy: ending the nineteen-year title drought and Scouse loyalty. Last season, Liverpool took the fight to Manchester United so far that their record would've been good enough to win the league most other seasons. Now Rafa's Premier League project looks shot to pieces. Defeat after defeat after defeat, an early Champions League exit, nine in the Premier League, fifteen in all competitions. It's their worst run since 1987, a rare season when the all-conquering 80's team ended trophyless as rivals Everton won the league and Coventry won the Cup. And you wonder how much he'd benefit from leaving Merseyside to start a new life away from the area. 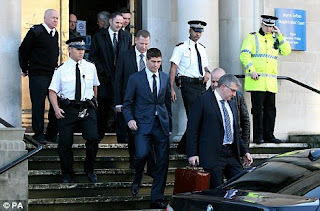 Motor accidents, house burglaries and the unfortunate incident in Southport which saw him acquitted in Court of punching a DJ, Gerrard's the right age to let his football do the talking - elsewhere. And there's one club and one manager that would suit him down to the ground. But it's unthinkable. If he could swallow his Scouse pride, if he could live behind 24-hour security in Alderley Edge, then Gerrard's football would be well served playing for Manchester United and Sir Alex Ferguson. I know, I know. 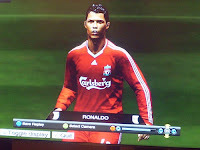 It'll NEVER happen - but seriously, where else would Gerrard's career be best-served? he's not a Southerner; Chelsea and Arsenal are just wrong for him. Barcelona and Real Madrid? Not sure. It might be as anti-climactic as Michael Owen's Spanish Adventure. Gerrard's problem is that he's tied his colours so tightly to the Shankly Gates that he's going to have to play himself - and Liverpool back into contention. But you wonder even for giant like him, it's a step to far. Gerrard needs to leave Liverpool after the World Cup in South Africa. WORLD EXCLUSIVE! The tapes from the bugged England dressing room! The FA are reviewing their security arrangements after it was revealed the dressing room at the team’s Grove hotel training HQ was bugged. Soccermongery’s got EXCLUSIVE access to the tapes. We reveal the astonishing aftermath of the decision to drop John Terry as skipper and replace him with Rio Ferdinand! 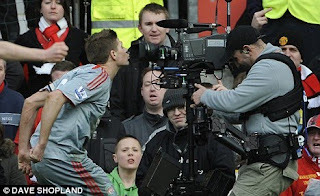 Also on Soccermongery: why FIFA's right to resist pressure to use video evidence and why Michael Owen's top level career is over. .... oh well, never mind! 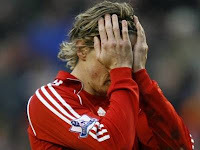 The Reds slumped to their ninth Premier League defeat of the season. And that's not counting all the losses in the Cups and Champions League. The Big 4? They're going to have to rebrand it. Click here: why Mourinho shouldn't return to English football. Michael Owen's cameo in the Carling Cup Final encapsulated his whole career in just 42 minutes. He scored a vital goal on the biggest stage, he took the chance in front of England coach Fabio Capello - and then pulled up with a hamstring injury and was withdrawn before half time. It rules him out for the rest of the season so extinguishing any flickering hope he might make the squad for the World Cup Finals. 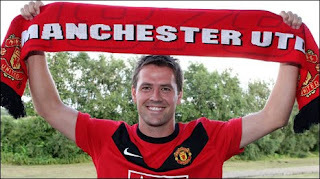 But with another year left on his contract at Old Trafford, Sir Alex Ferguson says Owen will be at United next season. He's praised the former England striker as sharp in training and good around the dressing room. And Owen's "loved every minute" at United, scoring nine goals in all competitions despite only starting eleven times. Despite a catalogue of injuries the 30-year-old still knows where the goal is. And true to his reputation for keeping the coolest head in the biggest cauldron, Owen's memorable strike in Fergietime against Manchester City together with his Wembley swansong proved he's never lost it. He says he's determined to return to peak physical condition for the start of next season - and he probably will. But that won't stop an old injury resurfacing. For a man who's hit 40 goals in 89 international appearances, his hamstring signals a miserable autumn to his career. So he'll struggle through another season at United. A bit part player in a successful side. His role will be even further diminished as Fergie will surely raid the transfer market looking to bolster a thin looking frontline led by Rooney, Berbatov and the thoroughly unconvincing Diouf. Even so, he'll still probably come off the bench to beat United's nearest title rival next season! Owen's developing interests beyond football - particularly in horseracing. He seems at peace with himself. It's just a shame for the rest of us Owen fans that his physicality doesn't match his undoubted goalscoring talent.